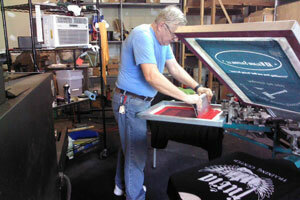 Our shop in Webster, TX is your source for custom screen printing, silk screening and embroidery. Check out our gallery to see some examples of our work from logo design, to screen printing to embroidery! We can fill orders of any size and deliver high quality products, get in touch with us today! ABCK's Enterprises is your Home Town source for custom screen printing, silk screening and embroidery. We can fill orders of any size and deliver high quality products that our buyers have come to expect. We work with a wide range of individuals, churches, companies and organizations. We offer an excellent variety of quality garments including golf shirts, t-shirts, team apparel, sweatshirts, caps, jackets, aprons and more. Use your own artwork or choose from a large selection of stock designs. In need of a logo or just looking to brush yours up? Not a problem! We have a design team that is waiting to form your image exactly the way you would like it! We take pride in each and every product we create. Our mission is your satisfaction. So give us a call today. We’re here to help!